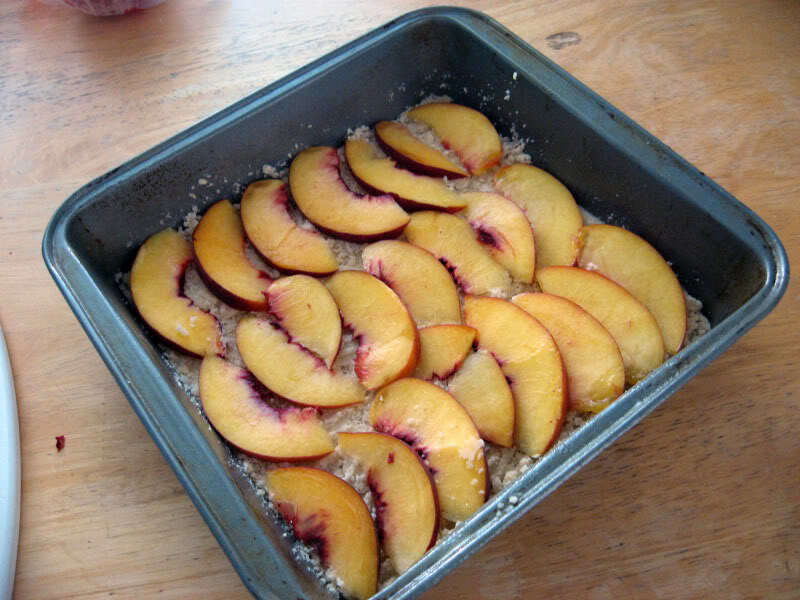 I was in the mood for something kind of breakfast-y and fruity the other day, and after seeing this recipe for a peach shortbread thing on Smitten Kitchen that looked easy enough, I decided to go for it. I'm not even a big peach fan, but I can take them in small amounts. And baked into things usually means they don't taste too peachy. It sounds like reverse psychology or something! But seriously, eating what was left of the peach itself, I was on the verge of a gag. Yep. Peaches. Not my favorite fruit. 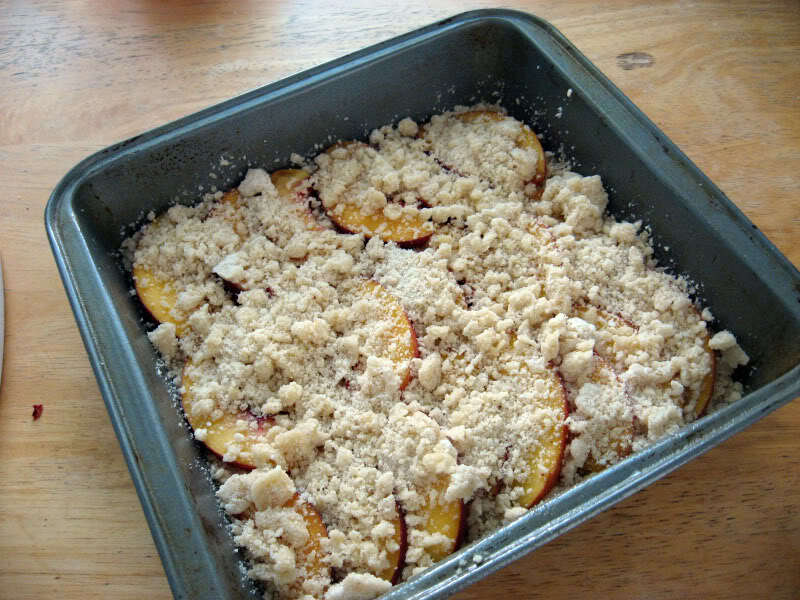 I'm calling this peach shortbread crumble because it does have a crumbly top. 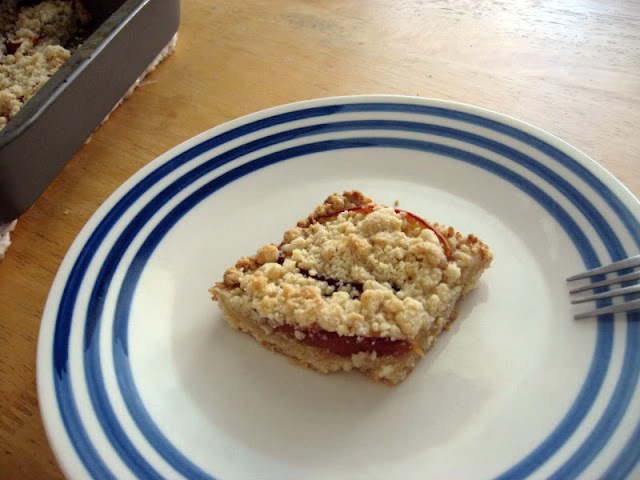 No, it doesn't have oats or even brown sugar like a normal crumble - but it counts! Because I say so! Her recipe is one that asks for a 9 x 13" pan, and since I am but one person, I decided to halve it. Below find the halved recipe! 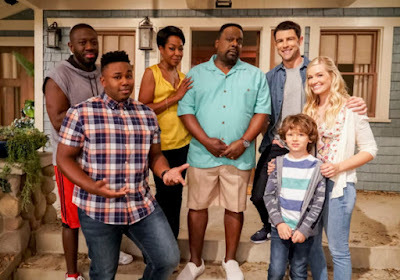 You can click above if you'd like to see the original. Preheat the oven to 375°F. Butter an 8×8 inch pan, or spray it with a nonstick spray. 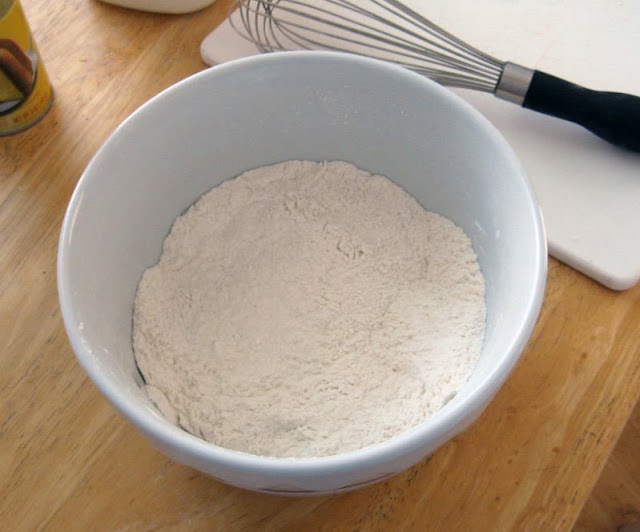 In a medium bowl, stir together sugar, baking powder, flour, salt and spices with a whisk. 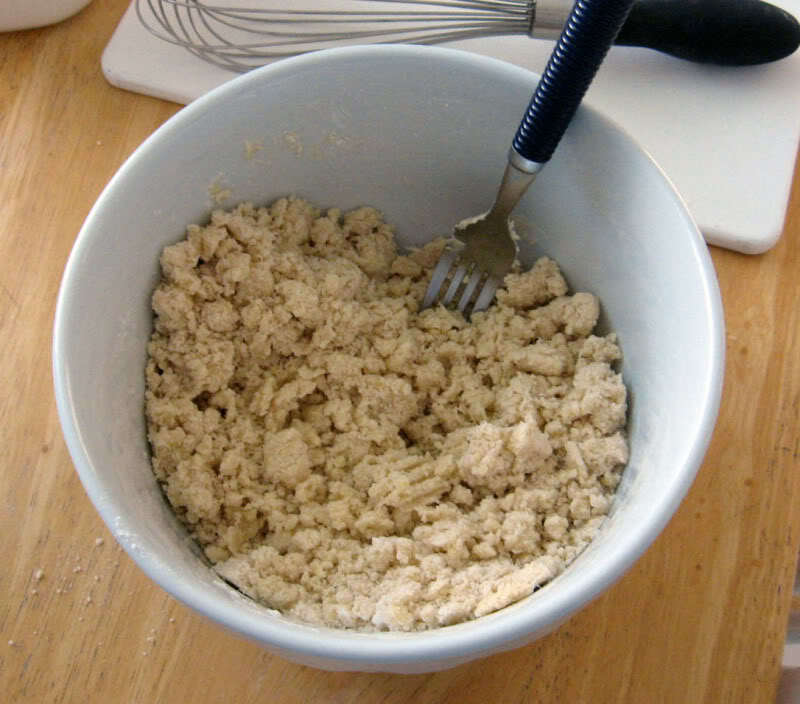 Using a pastry blender, fork or your fingertips, blend the butter and egg into the flour mixture. It will be crumbly. 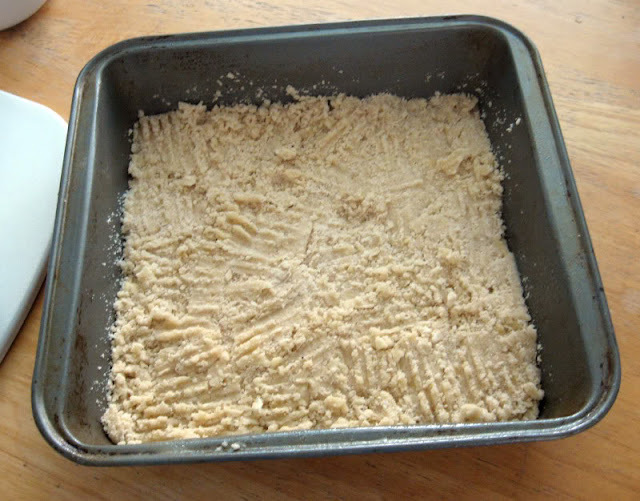 Pat 3/4 of the crumbs into the bottom of the prepared pan, pressing firmly. 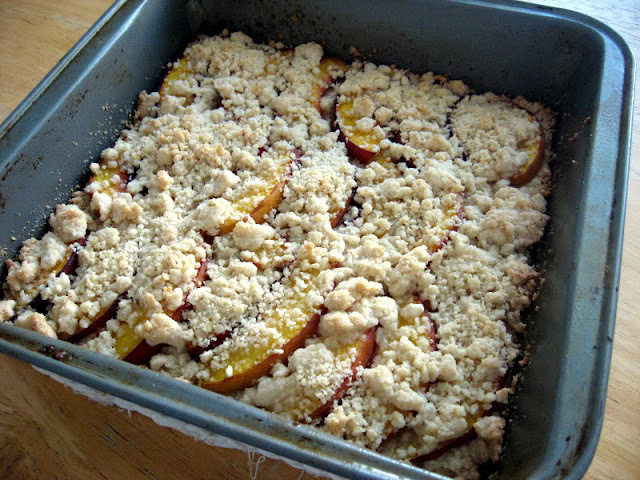 Tile peach slices over crumb base in a single layer. Scatter remaining crumbs evenly over peaches and bake in preheated oven for 30 minutes, until top is slightly brown and you can see a little color around the edges. Cool completely in pan before cutting into squares. This would be all of the dry ingredients. Can you even tell there is cinnamon and nutmeg in there? It's there, I promise! Here we've got the butter and 1/2 egg, which I used a fork to mix in. Yes, a half egg. I cracked an egg into a cup, beat it up, then poured half of it into the mix. I then microwaved the rest to eat as a bit of scrambled egg! Tip on softened butter: In this case you really don't want it melty. So, I heated mine in the microwave for 20 seconds at Power Level 6 (or 60, depending on your microwave). It had a tiny bit of melting, but not enough to disturb things. Here it is patted down in the prepared pan. I just used the fork to pat it down. And the layer of thinly sliced peaches. The rest of the crumbly stuff goes on top. And into the oven! Out of the oven. The edges are just starting to brown. So I may or may not have proceeded to eat four pieces. Um, what? That's normal. In fact, it's not so bad. I hadn't eaten breakfast, so that was basically my breakfast and lunch. In any case, it's very yummy. And if you like peaches, you'll probably love it all the more! I saw this recipe on Smitten Kitchen and thought it'd be delicious. Looks so good! It was definitely delish - and really easy!